Made to measure is more than a service: it is an experience. It’s one that starts with a consultation: between you and your seamstress. From here a process of hands, passion and skill starts that will take around 14 days from taking your measurements to delivery. "EVERYTHING STARTS WITH THE HAIR"
A typical clip-in may have up to 100,000 hairs. Each is hand-tied onto a weft by skilled hand. The journey has begun. 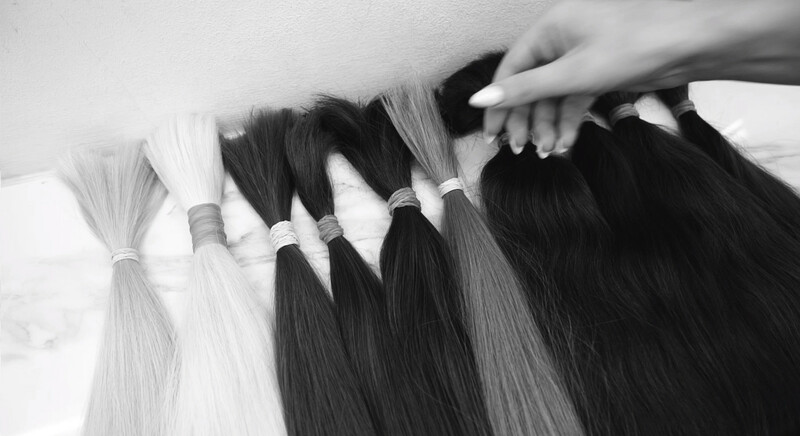 “The most exciting part of creating the clip-in comes when the hair is blended. It’s here when the true potential of the hair starts to show itself and the spirit of the clip-in begins to emerge." No check is more rigorous than the final inspection which happens prior to the label being sewn in. Here the clip-in will have minor adjustments made before it is finished. This clip-in will soon be ready for you to wear.